Is Sharif Making a Play for Counterterrorism Funds US Cut from Afghanistan Budget? Back in early November, the US carried out one of its most controversial drone strikes in Pakistan, killing TTP head Hakimullah Mehsud just hours before peace talks between the TTP and Pakistan were to begin. This move by the US seems to have pushed the TTP in a more radicalized direction, resulting in many new attacks. Pakistan’s government has responded to these attacks with counterattacks, effectively putting an end to prospects for restarting the talks. The government has finally decided to launch an operation against the feared Sunni terrorist outfit, the Lashkar-e-Jhangvi, and other militant groups involved in fomenting unrest in Balochistan. The decision was taken in a meeting attended by Interior Minister Chaudhry Nisar, Balochistan Chief Minister Dr Abdul Malik Baloch, the Quetta corps commander, the Balochistan inspector general (IG) police and the Frontier Corps IG. Dr Baloch was made in-charge of the operation against Lashkar-e-Jhangvi. It is important to mention that the decision to launch an operation against terrorists was taken following an attack on Shias in Mastung that killed 29 pilgrims on Tuesday. The Government of Balochistan has suspended buses carrying pilgrims from travelling through the province to neighbouring Iran due to security concerns after a suicide attack killed 28 pilgrims in Mastung this week. A 700 km highway connecting Quetta and Iran, home to many Shia pilgrimage sites, has seen dozens of suicide and roadside bomb attacks. “We have temporarily suspended the movement of buses on the highway until the security situation improves,” a senior official of the Balochistan government told Reuters on Friday. The provincial government then arranged C-130 flights to ferry 301 Shia pilgrims from Dalbandin town in Chagai district to Quetta International Airport for fear of more attacks on the pilgrims on Taftan-Quetta Highway. The pilgrims had entered Pakistan via Iran border in Taftan Town on Wednesday. “The pilgrims were stopped in Taftan and barred from travelling by passenger buses. They were later shifted to Dalbandin under tight security,” another official said. FC and Levies personnel escorted the pilgrims from Taftan to Dalbandin. Although the C-130 flights were provided by the provincial government, the Frontier Corps is under the control of Pakistan’s army and so there appears to be national coordination in this response, as is also indicated by Nisar being mentioned in the Pakistan Today article quoted above (Prime Minister Nawaz Sharif, although not mentioned in the article, is in the accompanying photo). https://www.emptywheel.net/wp-content/uploads/2016/07/Logo-Web.png 0 0 Jim White https://www.emptywheel.net/wp-content/uploads/2016/07/Logo-Web.png Jim White2014-01-26 11:47:132014-01-26 11:50:03Is Sharif Making a Play for Counterterrorism Funds US Cut from Afghanistan Budget? The past three days have seen a number of major attacks between Pakistan’s Taliban, known as the TTP, and Pakistan’s military. On Sunday, a bomb exploded in a van transporting Pakistani troops, killing 20. This attack took place in Bannu (Bannu will return to this story in a moment). On Monday, a suicide bomber killed 13 just a few meters from the outside wall of the General Headquarters of the Pakistani Army in Rawilpindi. Today, Pakistani jets killed at least 24 with bombs dropped in North Waziristan. “The explosion took place in a civil Hiace van inside Bannu Parade Ground at 8:45 am,” a senior military official told The Express Tribune. The blast occurred just as Frontier Corps (FC) troops had stepped into the van ahead of their departure. “The K-P paramilitary unit had rented a vehicle from the market for movement of its troops,” he added. The vehicle was supposed to carry the soldiers to Razmak, a town in North Waziristan Agency. District Coordination Officer Sajid Zafar Dall said that at the time of the attack a gaggle of children were heading to school. “Our initial assessment is that the bomber was possibly on a bicycle and he then approached the target on foot,” he added. Since it was morning time, RA Bazaar was bustling with office-goers and schoolchildren. Quoting eyewitnesses, Sardar Zulfikar, the SHO of RA Bazaar police station, said the bomber was walking towards the GHQ but detonated the explosive vest the moment he saw army troops at RA Bazaar’s main roundabout, T-Chowk. The building of National Logistics Cell is located nearby. The RA Bazaar is considered a high security zone due to its proximity with the GHQ. Police investigators believe the bomber intended to target the military headquarters. However, he couldn’t get to his target due to the tight security. Several suspected militant hideouts were trampled by Pakistan’s military’s fighter jets in Mir Ali area of the North Waziristan, killing at least 24 persons and wounding 15 more, various local news channels reported on Tuesday. The air strike followed a series of terrorist attacks across Pakistan in the past week, including Monday’s blast on a check post in Rawalpindi that martyred 6 army personnel and 7 civilians. Tehreek-e-Taliban Pakistan had claimed the responsibility for the attack. The events had led to a mounting pressure on Prime Minister Nawaz Sharif to take tougher decisions in response to the recent attacks by TTP. “This hadn’t been planned before, and Pakistan Air Force jets were called to hit hideouts of the militants involved in attacks on security forces,” said one military official speaking on condition of anonymity. It appears that the operations by Pakistani forces are continuing in several locations in North Waziristan. Pakistan’s government released this photo of Samiul Haq meeting today with Nawaz Sharif. The United States, mostly with John Brennan raining down drones, has been determined to see that neither Afghanistan nor Pakistan enters into peace talks with the Taliban. Recall that in early October, the US snatched Latif Mehsud from Afghan intelligence after they had spent months trying to convince him to help them initiate peace talks. Then, on November 2, the US killed Hakimullah Mehsud, just one day before he was to join peace talks with Pakistan. And with momentum gathering again for peace talks, Brennan even strayed outside the tribal areas of Pakistan in a botched attempt to kill Sirajuddin Haqqani, but still managed to kill a senior fundraiser for the Haqqani network. In his attempt to revive the process of peace talks with the Tehreek-e-Taliban Pakistan (TTP) and its affiliates, Prime Minister Nawaz Sharif asked Samiul Haq to help in bringing the militant groups to the negotiation table, Express News reported on Tuesday. Nawaz met the Jamiat Ulema-e-Islam Samiul Haq group (JUI-S) chief today for a one-on-one meeting at the Prime Minister House. Talks with the Taliban was the main issue on the agenda and Haq assured the prime minister that he will use his influence to ensure the peace process progresses in the right direction. Nawaz has been personally meeting various political and religious leaders in order to kick start the negotiation process with the militants. The JUI-S chief told the prime minister that every time the government planned to talk peace with the militants, foreign powers tried to sabotage the process. 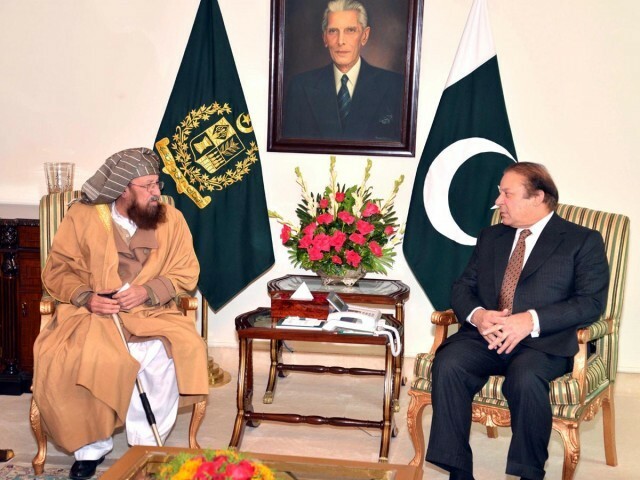 Talking to Geo News, Maulana Samiul Haq said that he met the prime minister on his request. He said to the best of his ability he would try to help resolve this issue and added that the core issue was to stall the drone attacks. US should understand that talks with Taliban were in the interest Pakistan as well as regional peace. He said when we get ready, foreign pressures do not allow us to proceed. Thousands of Pakistanis have been martyred in the war, which is not ours, he said. He demanded that the losses incurred in North Waziristan be compensated and advised the PM to revisit the foreign policy of Pakistan. Samiul Haq is nicknamed the ‘Father of the Taliban’ and runs a madrassa where several Taliban leaders were educated. I would think that while trying to start the peace talk process, Haq should stay well away from that particular madrassa. Haq seems to be putting Brennan on notice with his public statement about foreign powers disrupting peace talks. By announcing Haq’s role and releasing photos of Haq visiting with him, Sharif appears to be putting Haq under whatever protection Pakistan’s government can afford him. The ball is clearly in Brennan’s court now and today is Terror Tuesday He can allow the peace process to start, or he can put Haq at the top of his list and drone for war once again. Crazy Posturing Over Hakimullah Mehsud Drone Killing Drowns Out Key Question: Why Now? Virtually nobody openly welcomed the demise of Mr. Mehsud, who was responsible for the deaths of thousands of Pakistani civilians. To some American security analysts, the furious reaction was another sign of the perversity and ingratitude that they say have scarred Pakistan’s relationship with the United States. Christine Fair, a South Asia expert at Washington DC’s Georgetown University, claimed there was little prospect of the proposed talks achieving anything. Representative Mike Rogers, who chairs the House of Representatives’ permanent intelligence committee, said the slain militant, Hakimullah Mehsud, was a “bad guy” who was connected to attacks against Pakistani soldiers and to the Taliban in Afghanistan, which has forced closures of many schools for girls. Speaking to both local and foreign media today, Nisar said the identity of those killed in the drone strike was irrelevant. “The government of Pakistan does not see this drone attack as an attack on an individual but as an attack on the peace process,” he said. The interior minister said a three-member committee, comprising of Islamic clerics, was scheduled to leave for a meeting with the Tehrik-i-Taliban Pakistan (TTP) leadership on Saturday morning. Claiming that TTP leadership including Hakimullah was aware of the meeting, he said he had written and telephonic records of recent correspondence between the government and the militant outfit. https://www.emptywheel.net/wp-content/uploads/2016/07/Logo-Web.png 0 0 Jim White https://www.emptywheel.net/wp-content/uploads/2016/07/Logo-Web.png Jim White2013-11-04 08:36:462013-11-04 08:36:46Crazy Posturing Over Hakimullah Mehsud Drone Killing Drowns Out Key Question: Why Now?